To use the device, a person simply has to place the bag in the neck of a water bottle, and the bag cleans the water as he or she drinks. A single bag can filter up to a liter of even the most heavily polluted water. The bags are thrown away once used. "What is new about this idea is the combination of inexpensive raw materials, namely activated carbon and antimicrobial nanofibres, in point-of-use water filter systems. The nanofibres will disintegrate in liquids after a few days and will have no environmental impact. 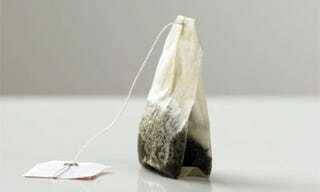 The raw materials of the tea-bag filter are not toxic to humans." The device isn't quite ready for mass production, but tests of the filter on nearby rivers have been successful. Clean water experts say this filter, which is applied just before people drink, is preferable to systems that clean water before it's distributed, because it eliminates the risk of recontamination. Best of all, the bag is cheap, costing a little less than half an American cent. Even that might be too expensive for those living on less than a dollar per day to use consistently, but it's hopefully cheap enough to have an immediate impact. You can also check out this video on the project made by Stellenbosch University.